One flea market, a few thrifted finds. Not too bad for January. Garage sale season is at least 6 weeks (or more) away in my area. Hangers with advertising are a favorite of mine, don't find them often. 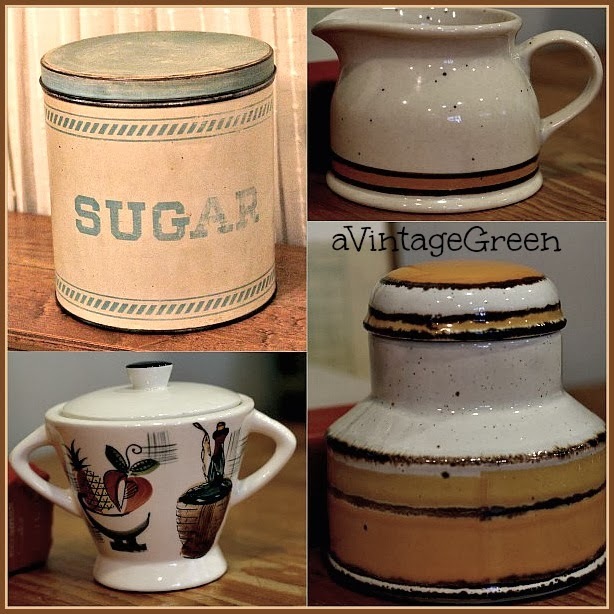 The turquoise/cream sugar canister was my best find in January. Made in Japan vintage brown betty 4 cup size. The two hole Shannon punch has been very handy this month. 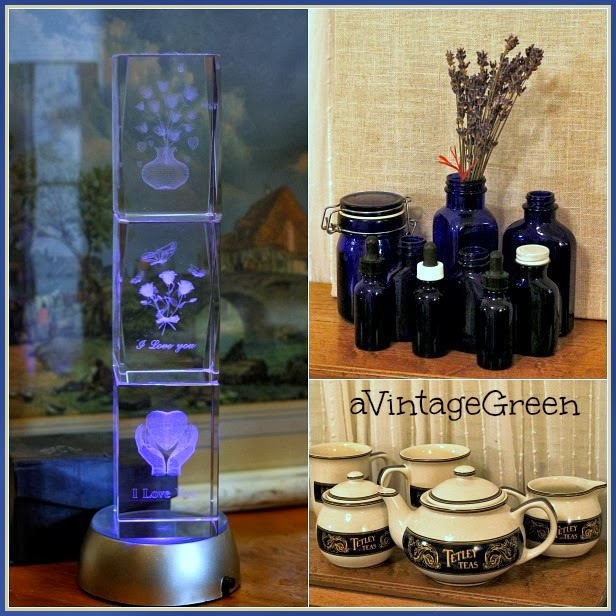 A little bit of Valentine mixed with blue glass bottles and a Tetley Tea Group. I love the blue glass bottles, I collect them. 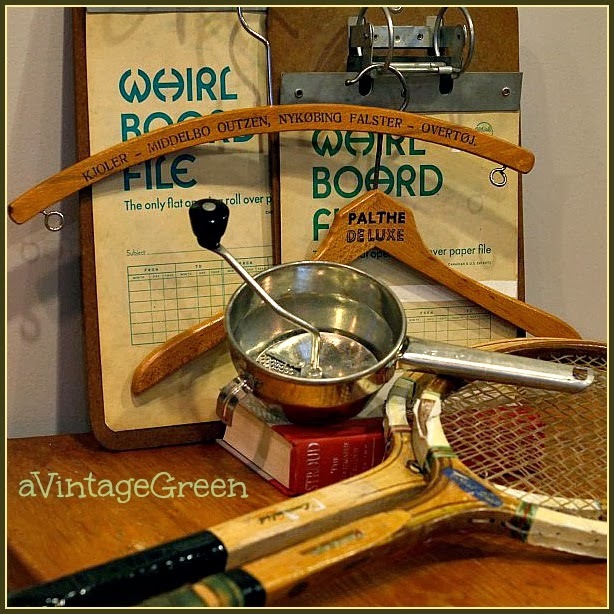 I found some old advertising hangers last weekend but left them behind as am not selling and don't collect them - do love how they look however. Nice finds! 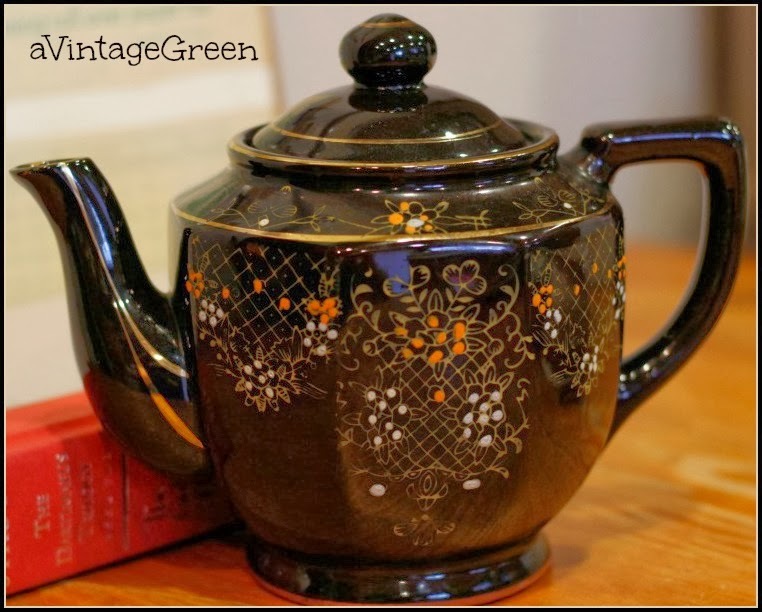 I am a huge fan of the brown tea post made in Japan, I have several myself. Love them. Your found treasures are all delightful. Great finds! I am so ready for warm weather and garage sales, aren't you? I love garage sales. We have them year round down here but more so in the warmer months. I seldom have cash money so I haven't been stopping much. I need to get some $$ and stash it in a certain place just for garage sales!! Oh, I love those blues. Thank you for sharing all your treasures at my party. 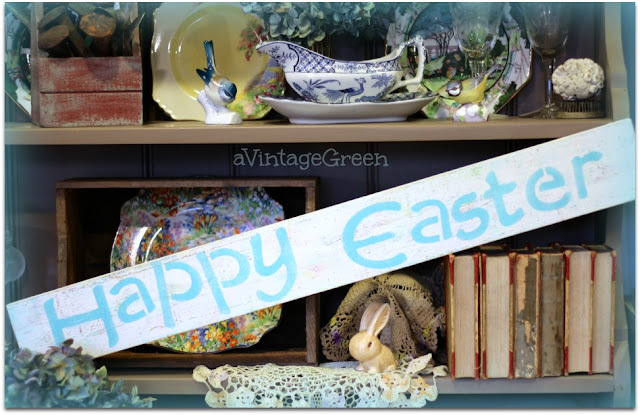 Love those vintage hangers and I have a brown betty that was my MIL's. Great finds! I love the hangers! And the punch. Very nice! Fun finds! Glad to see you can find some stuff in the dead of winter. My grandmother had one of those teapots. Great finds Joy ... I would love to find an old crock like that. Blue bottles are beautiful too. Nice finds! Love the canister and the hangers. 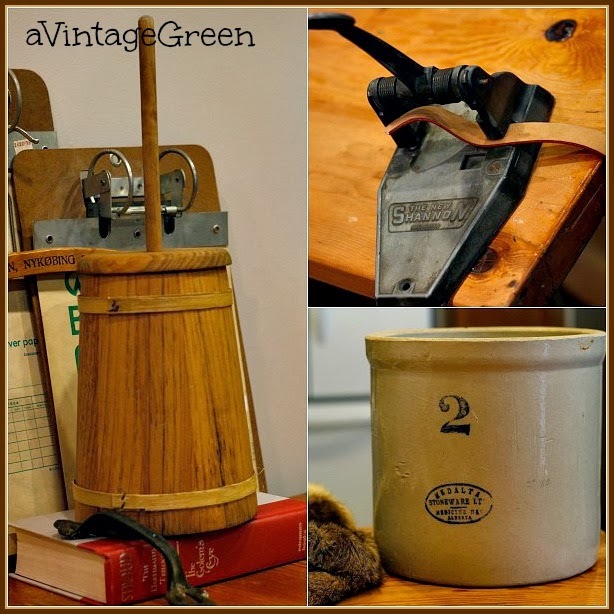 I've been lucky at the thrift shops and, of all places, antique malls, this month. Now it's too cold to even venture out, so I'm cleaning up finds and pricing. Oh, I would love it if it were only 6 weeks till garage sales! It is about 10 weeks for me! Luckily I have VOA's and Goodwill's all around me that I check out often. Don't see items like you found though! They are fabulous treasures!! Strange but true. I passed up a $4 set of creamer and sugar with the Chianti bottle decoration last week because the lid of the sugar had cracks. If I had known you would find another sugar . . . Love those blue bottles. Very nice Medalta crock...I have one in my living room. Did I ever tell you my Dad was the Medalta king? LOL. I have a beautiful old wooden hanger or two, from my husband's family. They are gorgeous. My favorite Aunt had that very same brown teapot and she had little cups that went with it that didn't have handles. Wonder whatever happened to that? Love all your finds! Great finds that should do well in a shop. Oh my Joy, I am drooling over that sugar tin. The color and patina is fabulous! Love the advertising on the hangers also. I have a handy hole punch like that. Thanks for sharing with SYC.